“Since its inception Donegal Oil has been distributing top quality fuels and lubricants,” said transport manager Steven Sheridan who was keen to enter the company’s latest tanker for the title of Fuel Oil News 2017 tanker of the year. 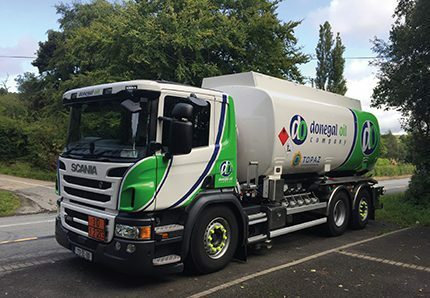 Starting out as a Shell authorised distributor, Donegal Oil is now a Topaz AD delivering on the periphery of Europe from three strategically-based depots at Letterkenny, Killybegs and Falcarragh. Offering a competitive price and an excellent service, the company is proud to count the offshore islanders of Donegal amongst its customers. “Operating in rural Ireland and conscious of maintaining the reputation we’ve worked hard to achieve, we place enormous reliance on our fleet of 8 home heating oil trucks and four articulated vehicles,” explained Steven. “Over the years the task of delivering our products had been entrusted to Leyland and Hino vehicles with the odd ERF and MAN truck brought into the fleet. “However, since the mid-90s Scania has been our vehicle of choice, so in late 2016 when the decision was made to purchase a new home heating oil truck, it had to be a Scania. “We talked to McElvaney Motors in Monaghan who recommended a P320 rear steer with a lift rear axle and day cab. This was a departure from the traditional 6 x 4 vehicles we’d bought in the past; our intention with this new vehicle was to have increased manoeuvrability whilst maintaining an adequate payload. “With a supply deal agreed on the base vehicle, we commenced the search for a suitable partner to build the tank and take care of the electronic metering equipment etc. After some discussion, Road Tankers Armagh was selected as the preferred build partner and since the vehicle hit the road we’ve been extremely pleased with this decision. “From our initial meeting, Trevor Wilson was very helpful and knowledgeable, guiding us through the myriad of options available for the modern-day vehicle. The final choice was a five-compartment Rigual tank with top and bottom loading capabilities. “Bottom loading is courtesy of an Emco Wheaton system complete with product transfer and high-level cut off. The metering operation is an electronic Data Plus Mk2 800 system which includes bulk delivery hose and anti-drive away protection. The pump is the tried and tested Blackmer TXH3 and the vehicle is also fitted with remote stop/start. “Fitted with aluminium mudguards, the vehicle, which is finished in white, is well-equipped with work lights for the long winter evenings ahead. “The graphics were entrusted to CBM Signs, a local Letterkenny company which designed and fitted the striking new livery. “In early July, just over six months after our purchasing decision was made, our new truck went to work. “Training for the electronic operating system was provided on site by the ever- enthusiastic James Wilson, who also gave the driver his mobile number just in case of any issues – another endorsement as to Road Tanker Armagh’s customer-orientated service. “To date the only teething issue that we’ve found was the front of the vehicle had very little ground clearance; McElvaney Motors put this right at the first service. “Our first new domestic delivery truck since 2011 incorporates many modern features not found on our older vehicles, but thanks to our suppliers it has been a smooth transition.